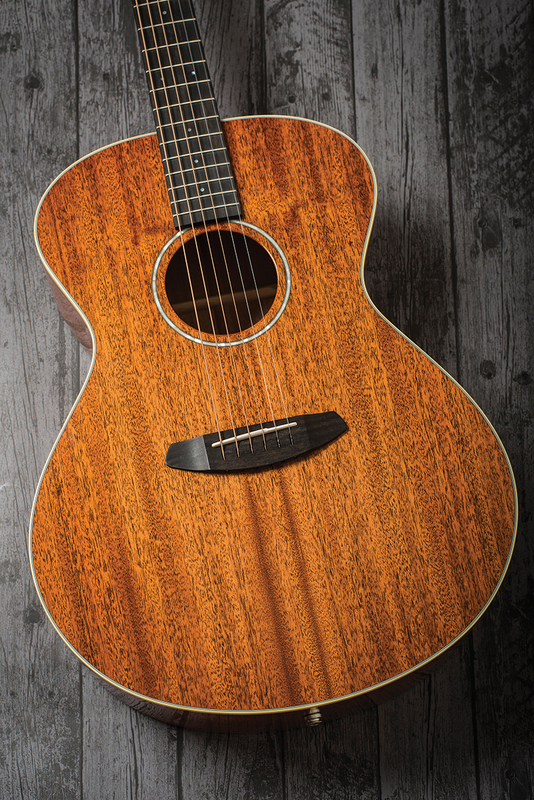 There was a time – and it was only a few years ago – when Breedlove was America’s third best-selling flat-top acoustic manufacturer. As such, Breedlove were the ‘best of the rest’ behind the giants of Martin and Taylor. Since then, the acoustic market has changed significantly, but despite not being as widely available in the UK as the aforementioned mega-brands, Breedlove has continued to quietly go about its business, producing high-quality guitars, and winning awards and admirers along the way. Unlike many high-end manufacturers, Breedlove makes the decision to never replicate the existing body shapes and designs of its longer-established competitors. Therefore, you’ll not find a ‘standard’ dreadnought, jumbo or OM within its range. Rather, the company’s R&D focuses initially on player comfort, “It’s all about the shape that feels right against your body”, state Breedlove. Finding the right tonal voice comes after finding the right body shape. The Concerto body shape of our review model has an interesting back story. Breedlove challenged itself to better the tonal performance of a dreadnought, but do so with a more comfortable body design. In reality, the Concerto’s dimensions are closer to that of a jumbo-sized guitar with the lower bout measuring just shy of 16 inches. At its widest, the upper bout measures 11.5 inches, which is closer to that of a regular dreadnought, with a waist of 9.25 inches, more akin to that of an OM shape. Running the rule over the key dimensions, the Concerto is something of a hybrid design of a jumbo, dreadnought and OM. That said, depending on who you listen to, some luthiers will tell you that the variations in ‘standard’ measurements can be compensated for by employing high-quality tonewoods in its construction. Straight out of the deluxe hard case (equipped with five clasps, one lockable), the Concerto is noticeable due to its understated, almost simple, appearance. With no elaborate inlays, fancy pickguard or intricate bindings, this Breedlove’s decorative cupboard is pretty bare. This suggests that the considerable price tag is due to the use of high-quality tonewoods and the painstaking, hand craftsmanship. The Concerto is an all-solid, all-mahogany guitar. The guitar’s soundboard is an exquisite cut, full of figure and grain pattern, and flawlessly bookmatched. Although we can’t be 100 per cent sure, the back appears to be a slice of the same slab of Honduran mahogany used for the top, which gives the guitar’s body a mirror-like appearance. Both the top and the back of the guitar are edged with aged ivoroid binding that has been fitted skilfully. As has a polyurethane gloss finish that’s as good as you’ll see on any guitar, at any price point – four layers sit atop four layers of sealer. The one-piece mahogany, low profile neck is hand-rubbed into a super-smooth feeling semi-gloss finish. In truth, the shape and sleek feel of this neck profile is possibly the most comfortable and easy to play this reviewer has ever come across. 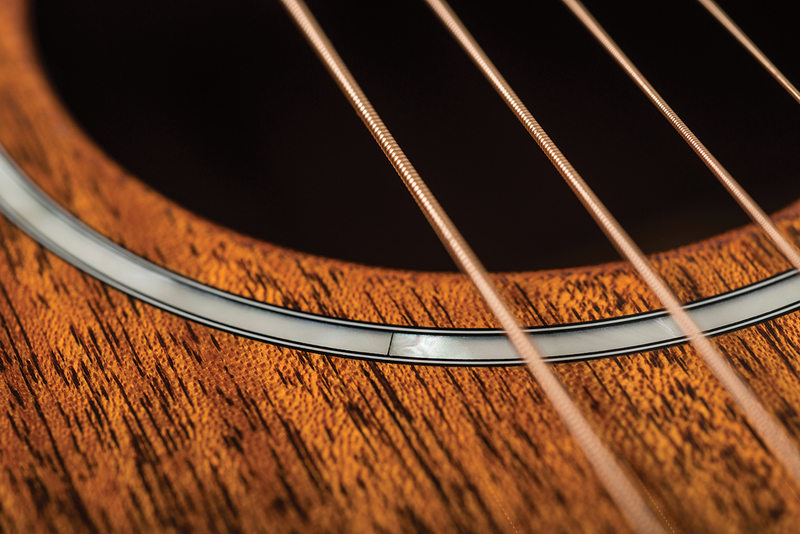 The soundhole rosette is inlaid with abalone. If you were being ultra- picky (and using a microscope), you could point a tiny gap of less than a millimetre where the two ends of the inlay strip meet, but even to mention it is bordering on harsh. 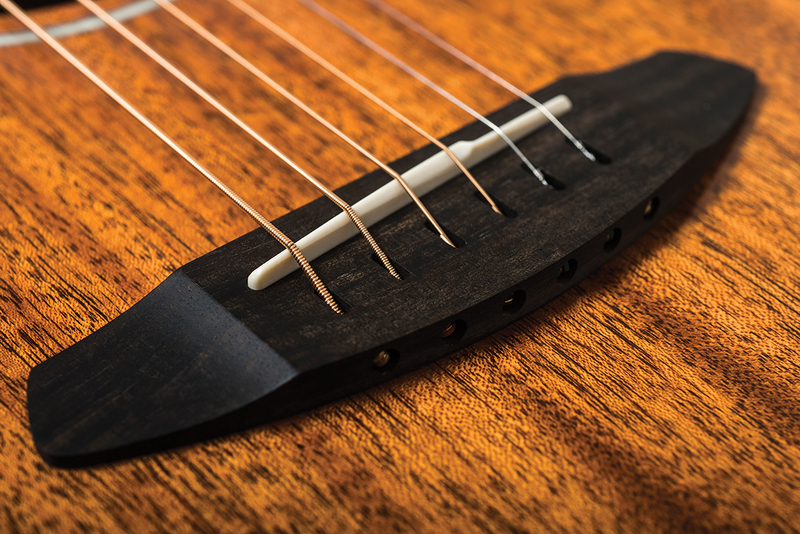 Both the fretboard and bridge are formed from African ebony, the latter being a through-string, thereby removing the need for bridge pins and resulting in a much cleaner, sharper looking arrangement. Some argue that not anchoring strings through the body with bridge pins sacrifices some of the tone, but our experience is that, if that is the case, it’s certainly not detectable to the human ear. The fretboard is home to 20 perfectly finished, medium-sized frets and centred, inlaid, position dot markers. 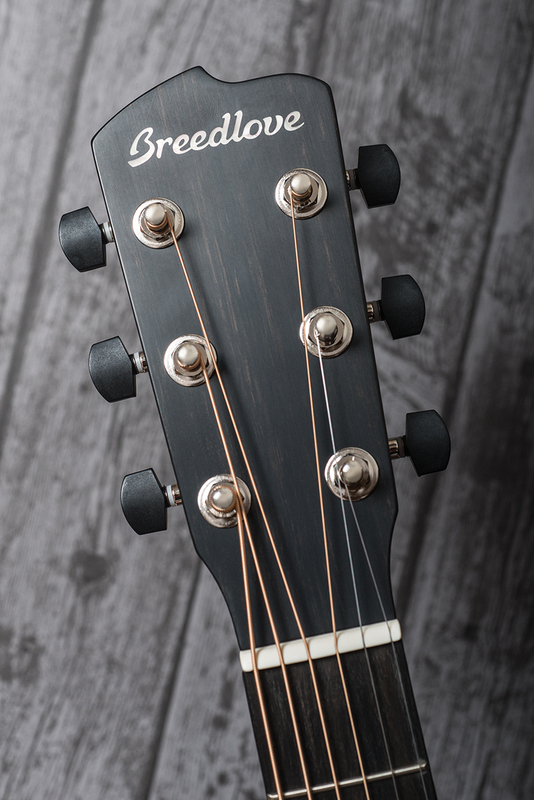 The ebony-faced headstock is again beautifully finished, and features Breedlove-branded, nickel tuners with ebony buttons. It’s a matter of taste but, while there’s nothing wrong with the tuners that are fitted, we can’t shake the feeling that a premium set of open-geared Waverly tuners would have been more in keeping with guitar of such high quality. Our review model comes loaded with LR Baggs EAS (Element Active System) VTC (Volume Control System) electronics, which features an under-saddle transducer and a Class A endpin preamp (which, by the way, makes this system well-suited to retro installations). The nine-volt battery that powers the unit is housed within a small pouch and Velcro’d to the inside of the guitar’s back. Access to it isn’t easy unless you remove the strings, but with 1,000 hours of battery life, it’s not something you’ll have to do often. 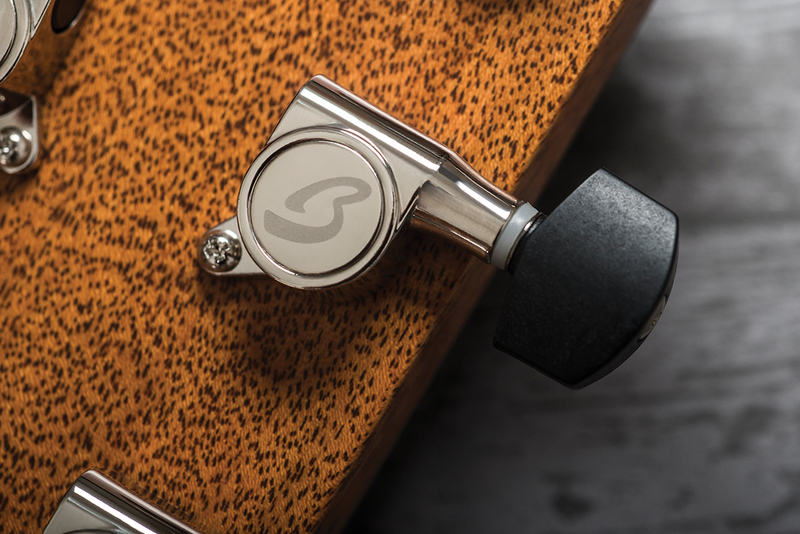 Volume and tone controls sit discretely just inside the bass side of the soundhole. Mid-song adjustments can be tricky, but if you’re a set ’n’ go type player, these types of controls are just fine. Overall, the Concerto E is a fantastically well-made guitar. Build quality, materials and presentation range from excellent to exceptional, and this example is evidence that Breedlove absolutely knows how to produce high-end instruments and justify the potentially eye-watering price tag. Having been so impressed thus far, we have high expectations for the tonal performance of the Concerto – and, boy, we’re not disappointed. If we had to some it up in one word, it would be stunning. Starting with some basic fingerstyle, what is particularly striking is the Concerto’s bottom end. Coming from deep within the bowels of the guitar comes a full-bodied, earthy rumble that never breaks up no matter how hard it’s pushed. The midrange is plump, rounded and full of textures, while the higher registers sing out with a clear, defined and glassy ring that encourages refined and ‘less-is-more’ playing. Play a bass note with your thumb and pick two or three strings over the top and an orchestral timbre issues forth. When plucked with a little more strength, it sounds like someone is rolling up an invisible volume control. Reaching for a pick and strumming first position chords opens up a world of resonance and harmonics. Really digging in and strumming with vigour doesn’t cause the Concerto’s tone to break up – the available headroom is truly awesome. The Breedlove comes fitted with 0.013-gauge strings, and these are no doubt needed to really drive the guitar and get the best resonance out of the soundboard. As such, we’d suggest it would be a mistake to fit lighter strings, which means the guitar is perhaps not the best choice for solos incorporating lots of string-bends. Plugging the guitar into our house Schertler David with tone controls set flat produces a similarly inspiring and remarkable tone. Roll in a touch of reverb, close your eyes and you could be filling a large auditorium. Whatever the style of playing, or genre of music, we can’t help but be seduced by the overall richness and musicality of both the Concerto’s acoustic and amplified performance. 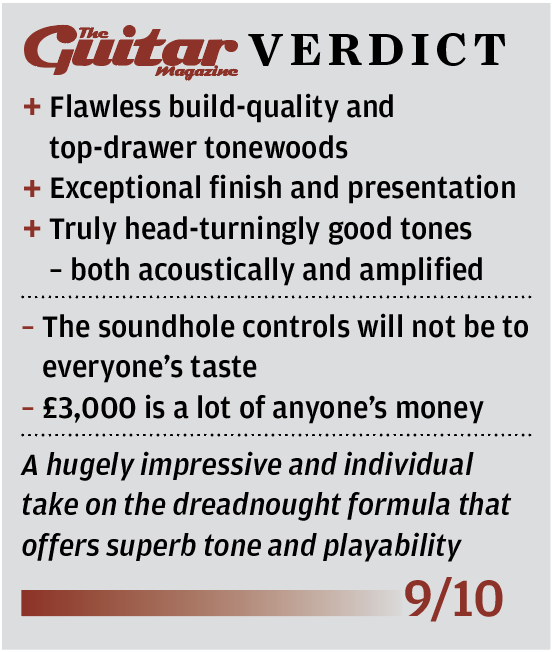 Regarding Breedlove’s mission to improve on a dreadnought’s tone, we’d suggest that the company has achieved that target – it’s just a shame we have to give it back! Impressive stuff.